The Russian Revolution of 1917 totally changed the traditional way of Russia's life and began a new page of history. 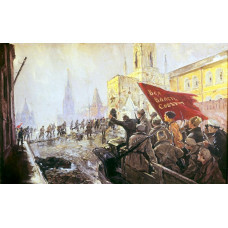 It was the collective term for a series of revolutions in Russia in 1917, which destroyed the Tsarist autocracy and led to the birth of the Soviet Union. The Tsar was deposed and replaced by a provisional government in the first revolution of February 1917. In the second revolution, during October, the Provisional Government was removed and replaced with a Bolshevik (Communist) government. This day went down in history as victory day for the Great October Socialist Revolution in Russia. This day is the most significant date in the history of the USSR. Vladimir Lenin was the central figure of the Revolution who inspired the idea and created the plan.